as always, keeping him company. In 1989, at the age of 20, Bill suffered a severe head injury in a traffic accident. This left him with restricted use of his left leg and arm and a short term memory problem. His parents were advised that he would never walk again but his mother, a polio victim, had other ideas and thanks to top neuro/physio treatment from the outset, an aggressive approach to finding and using ongoing treatment and Bill's indomitable spirit, Bill got out of his chair and walked, albeit very dependant on a walking stick. This made for a very much improved quality of life. It meant that the outdoors at his home on a farm in the rural Far North of New Zealand were no longer inaccessible. 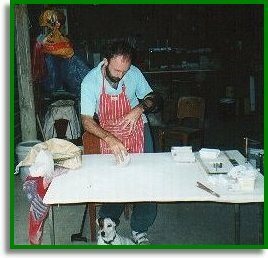 These days Bill leads a fairly busy life and when he is not attending physio treatment, working out in his home gym or making pots (including bonsai pots), he looks for something to do around the garden and farm. He works on a computer and has completed a course in automotive engineering. He is a fun person to have around and has a great sense of humour. Those who are familiar with head injuries will know the problems that go with the condition. Bill has worked with Ron Phillips with a great deal of success, to overcome or minimise the effects of the head injury so life in Bill's home is much the same as life in any normal, happy home. 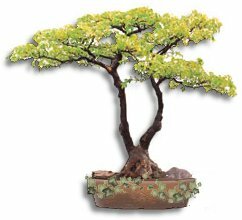 For more information on Bill's bonsai pots, go to the Bonsai Pots page. To see some samples of Bill's bonsai pots, go to the Bonsai Pots For Sale page.